Located on the Powder Highway! 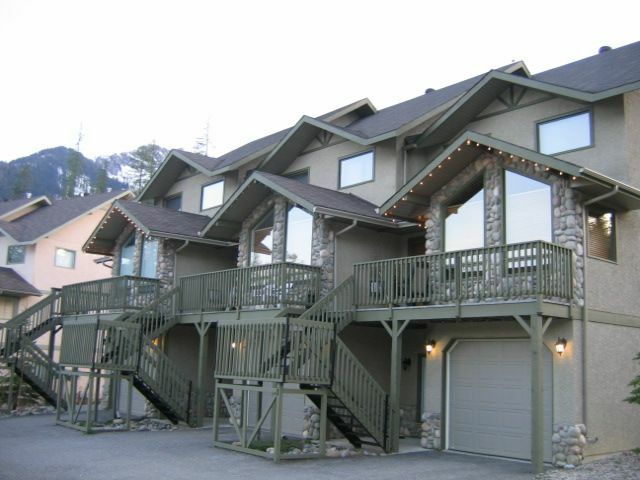 This luxury condo is truly SKI IN/SKI OUT five star accommodations. The condo is located on Holo Hike ski run at Fernie Alpine Resort. Fernie is known for its amazing powder averaging 29 feet of snowfall per year. In 2007, Ski Canada Magazine recognized Fernie as winner of Best Powder, Best Bar and Best Apres Ski Party in Canada. Ski out your door to the Elk Chair Lift, and after a full day of skiing, relax on the deck in your private hot tub or curl up by the cozy river rock fireplace. There are three luxurious bedrooms on the upper level. The master suite has a queen size handmade log bed, T.V., and private ensuite. The second bedroom has a queen size bed and a TV. The third bedroom is great for one family or the kids. It has a double over double handmade log bed and TV. There is also another full bathroom on the upper level. The main floor has a comfortable queen size pull out couch. Snowshoeing and cross country skiing are right outside your door. All the luxuries of home plus fabulous mountain views and some of the best skiing in North America. The town of Fernie is located 5 minutes away and offers shopping, restaurants and more. Fernie is a 3 hour drive from Calgary International Airport and a 1.5 hour drive from Cranbrook International Airport. Located on ski run (Holohike). Ski directly to your door. Ski to the Elk Chair. Garage is used for ski storage only. Private hot tub located on back deck. A wonderful accommodation and good access to hills. We were very pleased with our accommodation. It had everything we needed for cooking, relaxing, and having a nice time with family on a ski vacation. I'm glad you enjoyed your stay and we hope to have you back again soon. The condo was perfect for our group and we enjoyed the entire experience in Fernie. Great mountain, great town and unbelievable snow! Thank you Laura for the use of the condo and making sure it felt like home. I'm glad you enjoyed your stay and we hope to have you stay at our mountain condo again! Very quiet location, easy ski in/out, well appointed condo. Extremely comfortable. We're glad you enjoyed your stay and look forward to having you again next year! Just a quick note to say that we just loved our stay here over Christmas, 2016. It was a magical experience and everything was just as we expected. Laura, the owner even had a Christmas tree all set up and decorated to great us on our arrival as well as a special treat for us on the kitchen island ! The condo was immaculate and very well equipped. Laura was very helpful and we would certainly love to return again some day. I'm glad you enjoyed your stay. Looking forward to having you return. First time skiing for my grandchildren, visiting from Asia. The condo was very convenient for all of us to cohabit, to go back and forth from the hill p, and to host our family Easter dinner. Additionally, it felt like a home away from home - the youngest was calling it "my house" by the end of our stay. We just needed to stay longer! Plenty of room for 8 (2 families of 4). Large bunks, comfortable beds and bedding. Fully stocked kitchen with everything you could need, including quality appliances. Lots of room for everyone - kids sprawling and playing electronics, big kitchen table for meals and family game nights, large bedrooms, closets and dressers. Hot tub was wonderful after a day on the slopes, with a view of the mountains from the tub. True ski-in/ski-out - literally kick the skis off and climb the stairs to the back door. In the morning, ski down to Elk / Moose Platter and start your day. Safe ski / board storage on main level. Wonderful place - wonderful location - Highly Recommended. We would love to return for a future trip.